These strawberry cookies are soft, chewy, a little gooey and filled with chocolate chips. 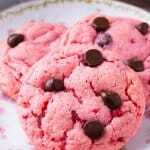 The pretty pink color makes them perfect for Valentine’s Day – and you’ll love how quick and easy they are to make because they’re made with cake mix. 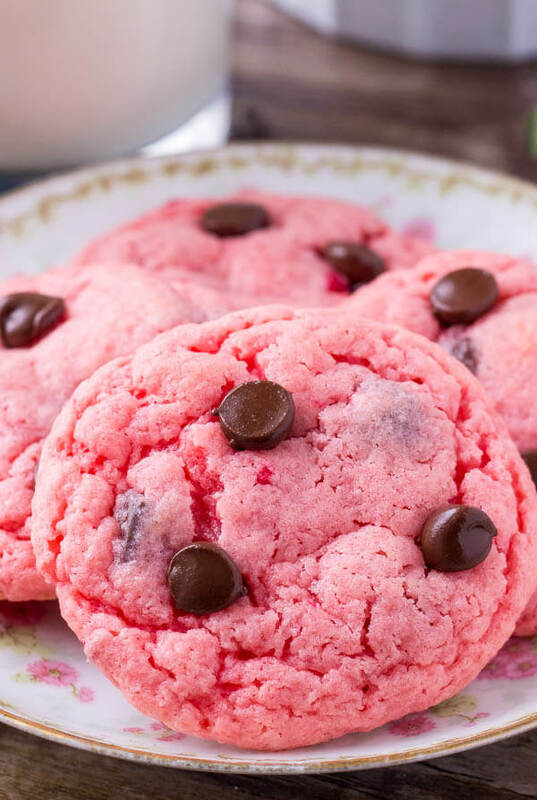 I wanted to make a really easy cookie recipe for Valentine’s day – and these strawberry cake mix cookies are just the thing. 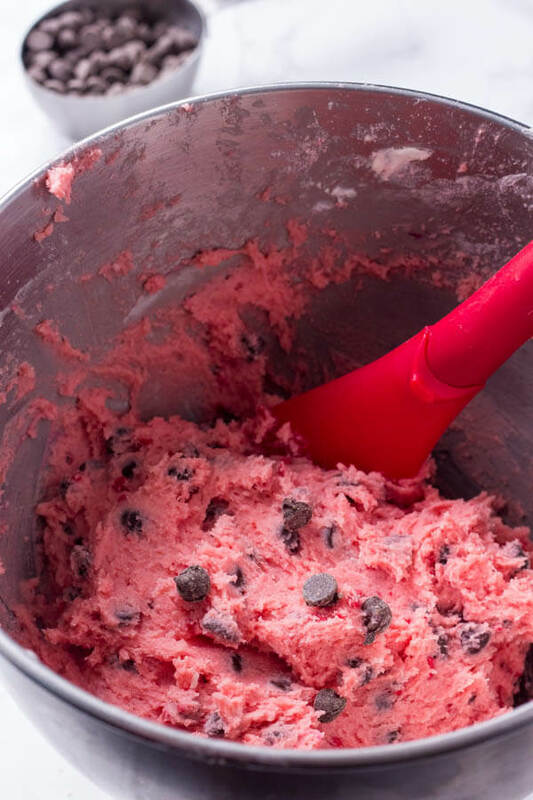 The bright pink color, melty chocolate chips & strawberry flavor is the perfect combination. And I’m absolutely in love with the the gooey, soft texture. To be totally honest though, I normally bake from scratch. It’s not that I’m morally opposed to using cake mixes or shortcuts. But I genuinely enjoy the baking process just as much as the delicious result. If your kitchen isn’t already fully stocked with baking ingredients, making a batch of cookies from scratch can get pricey. And at the end of the day – if it tastes delicious, who cares???? So after having some super tasty cake mix cookies at a friend’s house a few weeks ago, I decided to start playing around with cake mix cookies myself. And the result? 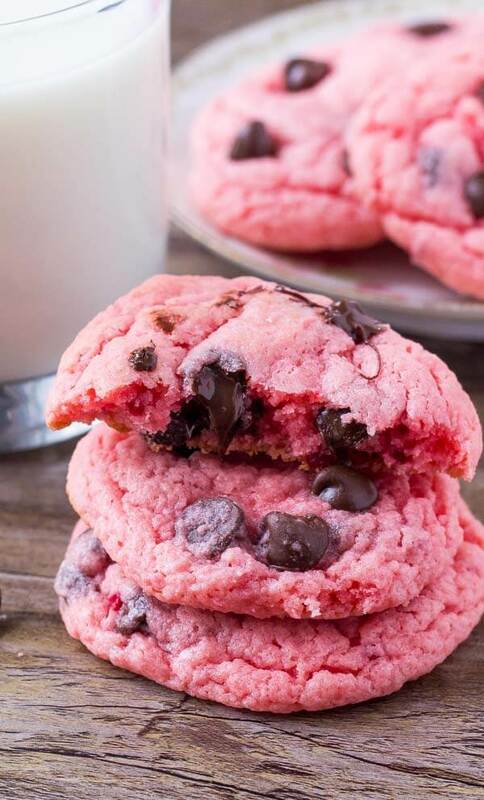 These delicious strawberry chocolate chip cookies. 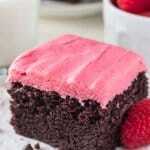 To make the recipe, simple beat together the butter, cream cheese & eggs – then slowly beat in the cake mix. The chocolate chips get folded in, and we’re ready to bake. The cookie batter is definitely sticky (which is what makes these cookies deliciously gooey and soft), so I recommend using a cookie scoop to form the dough into balls. If you find the dough is too sticky to work with, you can always pop it in the fridge for 30 minutes first. Our strawberry chocolate chip cookies will bake for about 7-9 minutes, but make sure to watch carefully as they can go from soft and chewy to a little burnt in the matter of a minute. After they’re done baking I like to add a couple chocolate chips on the top of each for some extra visual appeal (not to mention chocolate). 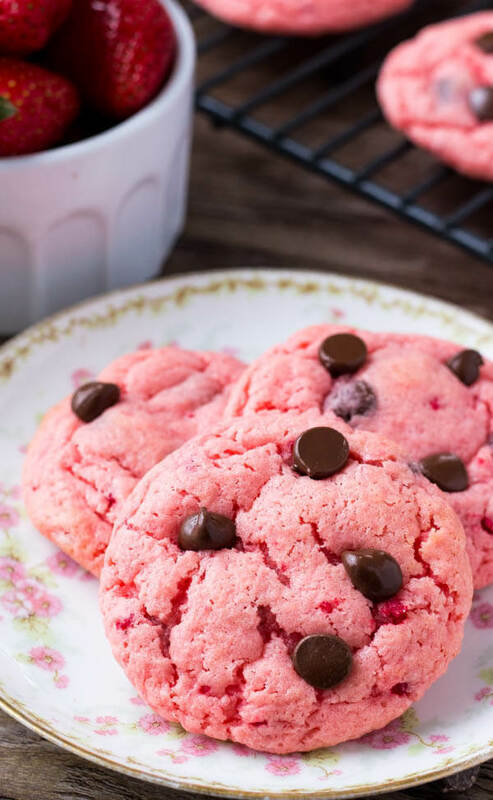 These strawberry cookies are soft, chewy, a little gooey and filled with chocolate chips. 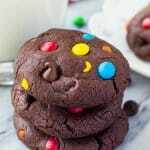 Only 5 ingredients and made with cake mix - so they're a quick and easy cookie recipe. Line cookie sheets with parchment paper or baking mats. In a large bowl beat together the butter, cream cheese and eggs. Sift in the cake mix and beat everything together. Form the dough into balls about 1 tablespoon in size - I recommend using a cookie scoop. (If the dough seems too sticky you can place it in the fridge for 10-30 minutes). Bake for 7-9 minutes or until the tops are just set. 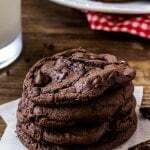 Optionally place a few extra chocolate chips on top of each cookie. Omg these are fabulous. I took the first batch out a little too early and they got flat, but I left the second batch in a little longer and they were PERFECT. Thanks!! My cookies look like little cakes! Why? Hmm….. different brands of cake mix can sometimes behave a bit differently. Next time I’d try flatting the cookies down in the center before baking or adding in 1 extra egg.